The Parkway Panthers entered the 2013 season with a lot of hype and justifiably so. Friday night, they started living up to it. The Panthers crushed Calvary Baptist Academy 55-13 in their season opener at Preston Crownover Stadium. Most observers thought this would be a tight game. Calvary came in ranked No. 1 in the Louisiana Sports Writers Association Class 2A preseason poll. Parkway came in ranked No. 7 in Class 5A. But the game quickly turned into a mismatch as Parkway scored three first quarter touchdowns and rolled to a 38-0 halftime lead. Parkway’s Austin Roth heads to the end zone after catching a pass from Brandon Harris during Parkway’s win over Calvary Friday night. “Tonight was just a night when everything went right,” Parkway coach David Feaster said. LSU commitment Brandon Harris completed 16 of 28 passes for 239 yards and three touchdowns before going to the bench late in the third quarter. Louisiana Tech commitment Brodrick Jefferson caught five passes for 98 yards, including a 39-yard catch for the Panthers’ first touchdown. 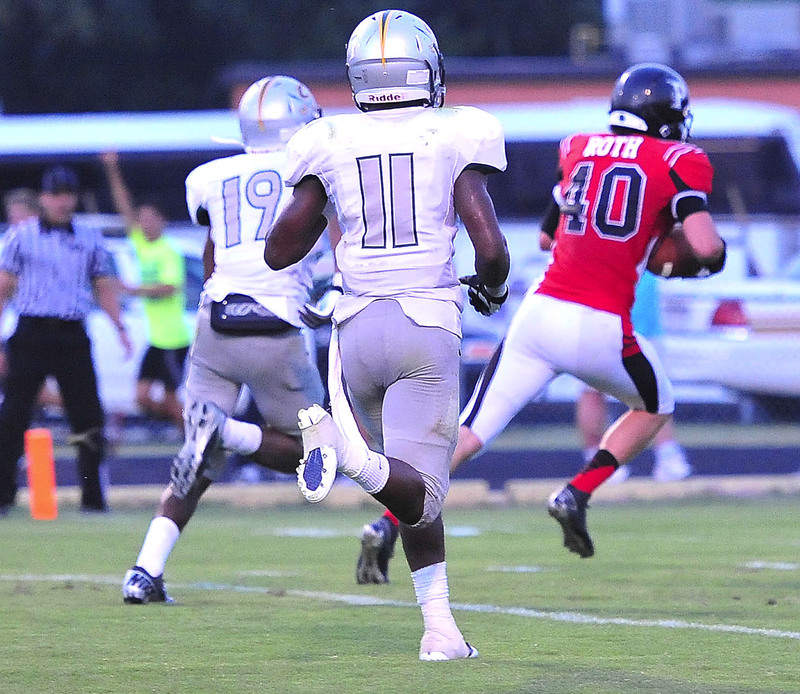 Junior running back Demetrius McAtee scored three touchdowns, two rushing and one receiving. He rushed for 63 yards on just four carries and caught three passes for 61 yards. McAtee’s rushing touchdowns covered 15 and 40 yards. His touchdown reception from Harris was 29 yards. Harris also completed a 28-yard touchdown pass to Austin Roth. William McKnight ran 60 yards for a touchdown. Placekicker Avery Shoebridge also got into the act, kicking field goals of 32 and 29 yards. He was also seven-of-seven on PATs. Backup running back Kei’Untre Normandin scored the final TD on a 15-yard run. The Parkway defense also did its part. The Cavaliers were down 41-0 in the third quarter when they scored their first touchdown. Their second came against Parkway’s second team. Dante Williams was in on nine tackles and recovered a fumble. Austin Averitt and Marquis King were in on seven tackles. Micah Lacy and Kaleb Monroe were in on six. Defensive back Hunter Huckaby was in on five tackles and had an interception. Chris Corly recovered a fumble. Calvary quarterbacks Shea Patterson and Jake Bartley combined for 226 passing yards, and the Cavs rushed for 158. But a lot of that came after the game was decided. “Our defense was kind of bend but don’t break,” Feaster said. “I didn’t think we were just outstanding at times on defense. Feaster was pleased with the way his team played almost mistake-free football while capitalizing on Calvary miscues.